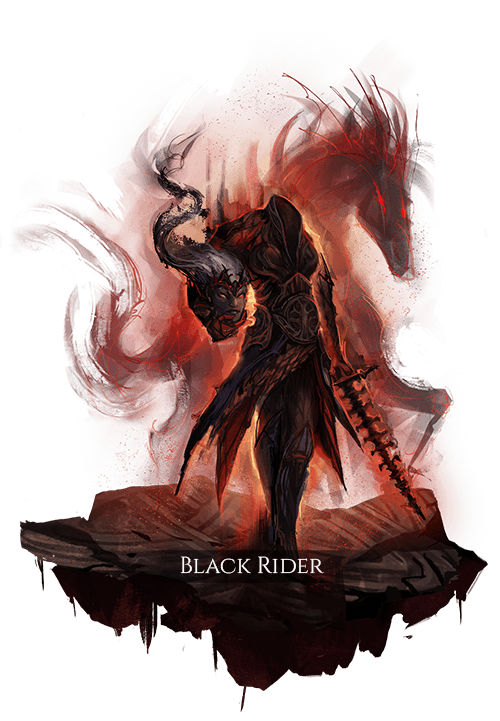 Also known as the Dullahan, the Black Riders are a frightening vision on the field of battle. These headless riders may be the most terrifying of all the shapeshifters. While their attacks may not be as physically powerful as those of their opposing Realms’ counterparts, their ability to spread fear and use their severed heads and spinal cords as weapons makes them quite the challenging foe. and the user also takes increased damage from radiant and fire attacks. Stamina regeneration is progressively reduced based on time spent in transformed states. Dealing damage builds Incorporeal Descent, allowing greater progressive degrees of Defilement transformation as thresholds are reached. The properties of armor and weapons equipped by the user have their stats incorporated into their transformations. These grant offensive and defensive bonuses relative to equipment quality and power. The user takes on an early stage of Defilement, transforming into a ghastly undead state, and replacing the user’s weapon with a barbed, spine-bone spear. to increase if the same body part is damaged. Increases the recovery time of a spear attack to add a physical debuff which causes bleeding if the attack successfully penetrates the target’s armor. If the affected body part was already bleeding, this attack increases the duration of the bleeding debuff and deals bonus damage. preparation and recovery times. Also applies the benefits of the user’s previous defilement as a chaos buff. by moving too far away, its cooldown time is greatly increased. the target and falls to the ground, creating an aura which applies a lingering death debuff that deals death damage over time to nearby enemies. If this attack kills an enemy, it has no cooldown time and requires no activation cost on subsequent activation, within a brief duration. affected targets take from death attacks for its duration. of wounds previously sustained and increases damage dealt with death abilities based on the total number of wounds the user has sustained. broken by damage, with its health based on the amount of power gathered. The user’s damage-absorbing shield explodes on expiration, dealing death damage to nearby enemies based on its amount of remaining power. the damage they take from death attacks for a brief duration. The user’s shield absorbs only a portion of incoming damage, but deals death feedback damage to enemies who attack the user. The shield regenerates its power based on the amount of death damage dealt by the user. A channeled ability where the user permeates an area with death energy, applying a portion of the benefits of their current defilement as a death buff to their nearby group members for a moderate duration. The user gains a death buff for the same duration increasing the damage of their death abilities based on the amount of damage dealt by their group members. On receiving a fatal wound, the user takes on a horrific transformation, becoming the personification of death for a short duration. The user gains a death buff which allows their next attack within a limited duration to deal high bonus death damage and cause a high amount of panic. When this attack is used or when the buff expires, the user dies.